These eye-catching, innovative bike racks serve their purpose with a creative style. The Spartan™ bike racks provide a much greater degree of bike support than standard bike racks, and allow a 25" clearance between each bike. Featuring a specially welded steel locking bar, which allows both the bike wheel and frame to be secured with a single U-lock. Mounting options include freestanding, in-ground mount, and surface mount. These bike racks are offered in a galvanized and powder-coated finish. 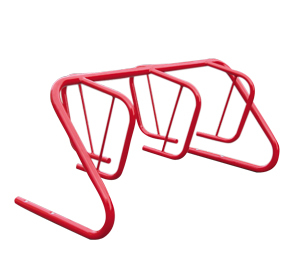 The Spartan™ bike racks are available in single or double sided arrangements of various lengths up to 13-bike capacity to maximize your bike storage. Drop In Anchors available for concrete installation.